"BBM boost (18 mA) driver for Nichia ring" I copied this from the OP of this thread. What does BBM stands for? BadBoy??? At this point I am guessing but I suspect it is bad boy mother board. These lights are incredible Don! Any chance of a return one day? Seems the drivers that are out there now would make this much easier to accomplish. I have learned to never say never. But there is a lot more than just sourcing a new driver or set of drivers. The 5 mm LED's would not work with either reflector (LS 20 or LS 27). Heck I still have a number of PCB ring sets with the original Nichia 3 MM LED's as well as reflectors for both the 20 and the 27. My problem is that I can't get behind the expense and effort of bringing a new light out unless it is something I personally believe in and it needs to meet my quirky set of requirements. I want simple, functional, no cut corners in materials to save on cost and little to no maintenance. I also want the light to last longer than the owner needs it to in terms of service life. And first and foremost, it is an illumination tool. Combining a throw beam with a flood beam has real utility and that is what motivated the LunaSol lights. But as has been said, multi levels now with the super bright LED's became a more significant priority when it came time to decide how best to utilize a simple UI with simple on-off switch. Heck the LED's have not gotten so bright that I personally am happy carrying a Mule with HIVE converter as putting it on the turbo high can reach out almost as well as an older LED with throw! Granted to really reach out requires a good collimated beam but that is a specialty tool for me. 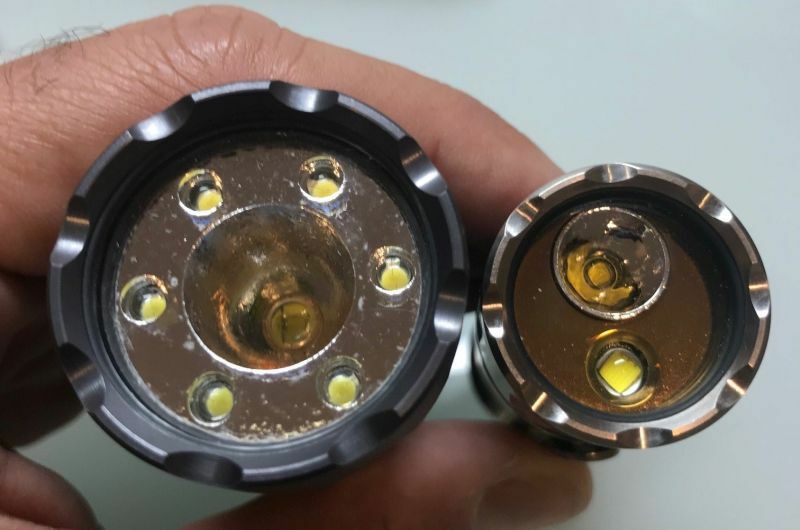 I am not alone in enjoying these high power LED's and case in point is the very popular 3 and 4 LED lights out that generate enough heat and light to be dangerous. They don't have any real throw in terms of tight collimation but are effective by virtue of their silly levels of lumens! I have a pretty well designed dive light made by Light & Motion and it has a set of LED's for throw and a set of LED's for flood and a slid switch that can allow you to both chose flood or throw and adjust the level of light output on either. It is a very useful tool. I don't like the fact that it is never off unless you get into the light and disable it. It has enough parasitic drain that I can't put it away and expect it to be ready to go seeks later without first charging it back up. This light has a reasonably friendly UI but it is way more complicated mechanically than I am capable of duplicating in a light that is low to zero maintenance and capable of survival in harsh conditions. I mention this light because I think it takes the LunaSol design to the next level but it is a package and proposition beyond my ability and not suited for a small pocket friendly light. I do have an idea for throw and flood but I need time and to put more thought into it. I am motivated to keep it simple and versatile. Thanks for sharing your thoughts Don! If something does come down the line, we can be sure you've put a lot of thought and consideration in. I hope Don can forgive me for mentioning another maker in his thread, but Enrique Muyshondt has the Beagle now with the combination of a throw emitter and small 3mm (I think) LEDs for flood. An homage of sorts to the LunaSol design. I haven’t been able try one. Has anyone with an LS20 and a Beagle been able to do some comparisons? It seems like that is the current closest offering in utility and quality to the LS line available from our custom makers. I confess I have been on a triple kick lately as Don alluded to above. I have a Mac Ti Tri with an Okluma LE, an Okluma TinyDC, an Adventure Sport brass triple, a BOSS, and two Arc LS modded by DatiLED with triples. These offer for me a great blend of flood and throw for most of my mid range uses. I still cherish my two Haikus, but there’s certainly merit to the idea that triples with optics provide a very utilitarian beam coupled with more than sufficient output. I'm happy to note this Don. It is indeed your safety first approach with no cutting of corners and producing durable and bomb proof lighting tools which just happen to be beautiful too, which makes me value your lights so much. Having read comments about the other lights that paid homage to your LunaSols, its my impression that they certainly don't meet all of your non-compromising criteria. Thanks for the explanation Don. Looking forward to the throw and flood light you mention here. Take your time...we will be here for whatever you create. I must admit the ringed flood and reflector throw are something I would love. However, with that said you are the flashlight guy, worldwide, and I have had my first of many Haiku's clipped to my pockets for 8 years, except my London Savile Row bespoke suits, have to pocket Drop it. Nevertheless, I think here would be plenty of guy's who would buy these. If you made a red flood and white throw, I would buy that and all other combinations, like a UV, and white throw, for all the travel I do, as a blue flood, as well. Thanks for making the best lights ever!! Last edited by RedLED; 05-07-2018 at 02:36 PM. This LS20 has always been a favorite of mine..... though I rarely take it out .... It is almost a hanging offense to mod one of these lights but at the time I wanted something with more up to date leds. The LS20 / 27 with flood and throw are the best of both worlds. Last edited by stoli67; 05-07-2018 at 04:51 PM. I haven't seen one like the one on the right before... You modified it that way? What's in it? That appears to be a DaFAB mod. Not sure how much detailed modding discussion McGizmo wants in his own threads here. You are right of course but a new version straight from the factory would be awesome.